Back in 1973, I vividly remember being glued to a BBC Omnibus film about a crazed red-headed musician motoring across the Sahara. 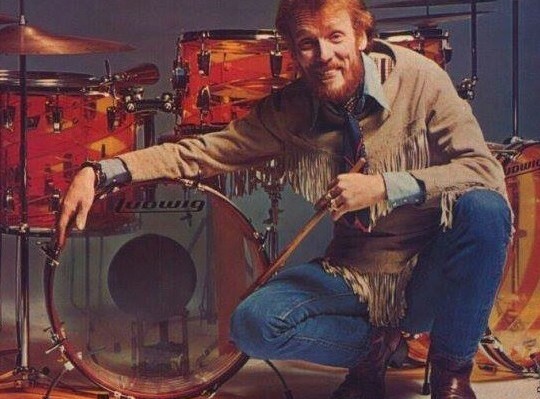 This was the superstar drummer Peter “Ginger” Baker, heading for Nigeria to explore his fascination with African rhythms. Forty years later, in 2013, the drummer made a surprising and explosive return to the screen in Beware of Mr Baker, a documentary in which he tells the story of his colourful and chaotic life. The film was made by a young American, Jay Bulger, who became fascinated by that Omnibus footage and was surprised to find that Ginger Baker was still alive, holed up in South Africa with his fourth wife and a team of polo ponies. Bulger went out to meet him, writing a piece for Rolling Stone magazine before hauling in the movie cameras. While the film shows the former Cream and Blind Faith drummer as a passionate musician and a pioneer of world music, it also spotlights his grumpy and argumentative nature. Baker was never the most co-operative interview subject, and at 73 he still splutters and swears at questions he deems to be ignorant or impertinent. What has changed is his appearance: the flame-haired Van Gogh of the drums seems to have morphed into Albert Steptoe. Baker’s bolshiness is all over this film. He delights in slagging off the late drum heroes John Bonham and Keith Moon. We learn that his violent tussles with Cream’s bass player, Jack Bruce, drove their bandmate Eric Clapton to tears. And in a shocking moment that opens the movie, Baker bloodies Bulger’s nose with his metal walking stick when he hears the film-maker plans to interview people from the drummer’s past. The idea of dredging up old associates is anathema to a man who has spent much of his life escaping from what 1960s musos called “bad scenes”. After taking heroin to improve his drumming (as you do), his attempts to shake off his addiction and “get straight” took him to Hawaii, Jamaica and the depths of despair. In 1982 he decided that getting straight meant escaping “from anybody I know”, so he left his first wife and shacked up with his daughter’s boyfriend’s teenage sister in the Tuscan hills. The girlfriend became wife No 2 before she abandoned him. I wondered what Baker’s family thought of the film. “We’re all thrilled with it, because it’s so accurate,” said Ginette, his eldest daughter. “That’s how he is. But I think it’s a good legacy piece. He’s very talented, and I think talent is no indication of what sort of person you are. I don’t think they’re linked at all.” She was amazed to see rare archive footage of her father fighting “drum battles” with jazz heroes such as Art Blakey and Elvin Jones. “I don’t know where Jay Bulger found some of that.” What was Ginger’s opinion of the film? “He gave it 85%,” said Ginette. I may have seen the softer side of Ginger Baker – some of that other 15%, perhaps – when I interviewed him in 2010. We discussed his passion for horses, and for the poetry of Gerard Manley Hopkins. “I love his stuff,” he said in his deep bass-drum voice. “It doesn’t seem to follow any set rules or pattern, but it works.” It seemed apt that this legend of rhythm admired a poet who had experimented so much with the rhythm of verse. And Baker was jocular about his own deafness: he said that during a drumming demonstration he had given, someone asked: “How did you start on drums?” Mishearing the last word, he replied with a stern lesson about why “drugs are a bad idea”. You can buy Ginger Baker’s riveting autobiography, Hellraiser, here. Tony Barrell’s new book is The Beatles on the Roof, which takes an unprecedented close look at the Beatles’ final live performance in 1969. You can buy it at Waterstones HERE – or at Amazon HERE. It’s out in North America on September 6, 2018. Australians can buy it online at Angus & Robertson here, or from Amazon in Australia here. Share the post "THE GREAT GINGER BAKE-OFF"
Wow! Ginger rules. It must have been amazing to meet the man.